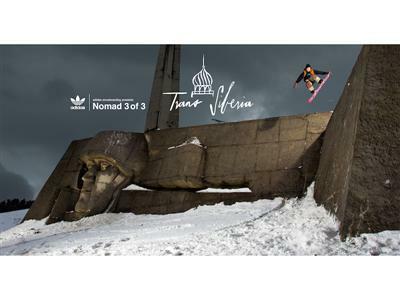 In TransSiberia, the third and final part of adidas Snowboarding's Nomad series, global team riders Keegan Valaika and Forest Bailey travel by train with recently appointed international team rider, Alex Tank. The crew was joined by newly named Russian team rider, Artem Smolin, and friend Jonas Michilot who came along for a ride that took them deep into the urban wilds of Russia and Mongolia." We wanted to go somewhere new and somewhere that we were going to remember for the rest of our lives," says Keegan Valaika. "Something that no one had ever really done before." Forest says about the trip, "I've wanted to go on a snowboarding train trip for a long time. The idea for the TransSiberia trip came along but it almost didn't work. We were so unsure about the snow out there. You can't really plan it, you just go over there and figure it out on your way." The team traveled from Moscow to Irkutsk in Siberia, ending in Ulan Bator — the capital city of Mongolia. Train is one of the only in-roads to these unique cities, and the riders experienced the same route that nearly 100 years earlier had carried Russians from the Revolution. Limited by knowledge of the local terrain, language barriers and easy access to guides, they sought out epic, never-before-ridden street terrain on their own. The 10 minute video focuses equally on the trek and the tricks across the continent's most exotic locations.